Last week, Social Media Week Chicago turned five, hosting its annual discourse on the latest trends and tactics impacting social media, content marketing and connectivity for brands, their teams and their customers, and individuals at large. 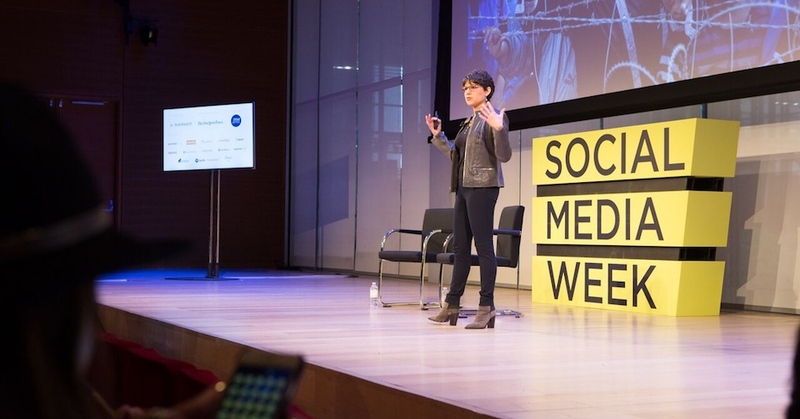 This year’s Social Media Week theme was Upwardly Mobile: The Rise of the Connected Class. Under this umbrella, sessions tackled everything from tech trends to social media measurement to crowdfunding to infographic design—all drawing back to the idea that technology is enhancing how we communicate, organize, work and innovate. As insightful as this year’s theme was, not every panel was revelatory. But, the speakers who stood out really knew their stuff and were a perfect balance of information and inspiration. Social media strategy and effective content marketing are intimidating endeavors, and the best sessions on these subjects broke down best practices into guiding philosophies and actionable items that went beyond any particular platform or agency offering. They outlined the trends dominating our work as brands, marketers and creatives, and how to work with those trends to galvanize a community and stay relevant to them. In part one of our two-part Social Media Week Chicago recap, we focus on our four biggest takeaways for fine-tuning your content marketing and creating relevance with your customers in 2016 (and beyond). It was stated a few different ways over the course of the week, but the point was clear: Your content is more important than ever, but it doesn’t matter how good it is if your customer isn’t listening. Today, your brand isn’t just competing with direct competitors for the mindshare of your customers, it’s competing with everything out there. Amid all that noise, you have to determine the best way to reach your customer. That means more than using every platform at your disposal. It means using the right platforms to enhance your communications strategy and doing so consistently. What resonates with your Twitter audience might not work as well on Facebook. It’s important to recognize that. The same is true for platforms that brands are still figuring out like Instagram or SnapChat. They’re only good for your brand if they reach your customer with a message that’s relevant and resonates with them. How do you get your customer to listen? Show them you know them. As it was described by one speaker this week, if you aren’t speaking to your social media community the way they speak to each other then you’re like the loud weirdo at the party everyone else is trying to avoid. To speak authentically to your audience, you need to get specific. Hyper segment your target by moving past demographics to address specific desires or need states that you can credibly speak to. This creates specific value for you and your customer. You answer a specific need for your customer and they respond by taking an action that meets your content marketing goals, whether that’s impressions, engagements or conversions. Turkey Slices is term used by the master content marketers at LinkedIn, who gave a presentation about their approach to creating meaningful content and making it last. In a nutshell, the idea is this: create a central piece of content like an ebook or white paper that answers one of the biggest questions for your customers and publish it as gated content. That’s your main course, or your turkey. Then take that gated content and break it up into bite-size pieces of snackable content, or turkey slices, that you can use across platforms to drive leads back to your site (or a landing page) to get their hands on the main course, your ebook or white paper. This snackable content can—and should—take many forms: blog posts, Slideshare presentations, infographics, webinars or videos are just some examples of what you can do. Used correctly (see No. 1) to meet a specific need for your target market (see No. 2), this is a proven strategy to achieve best-in-class content marketing for your brand or business. This last point may not resonate immediately with you, because a lot of brands don’t have a personality that lends itself to starting parties. But the point is simpler than that. Be interesting. Speak to your audience in a way that they haven’t been spoken to yet. Be relevant to consumers first and in that way, capture their attention on a personal level and make them feel like the conversation is their conversation. That’s powerful stuff on social media—powerful enough to get them to engage with your content. If that engagement is a retweet or a share, then your customers are getting the party started for you, and they just invited all their friends. Stay tuned for our our the second half of our Social Media Week Chicago re-cap, coming a little later in the week.